My name is Roksana Badruddoja. I am a Bangladeshi-American woman, a queer mother to a precocious 12-year-old girl who is negotiating her “brownness” at school, and a professor of sociology and women’s and gender studies. I speak/write to you today “worn out.” And, I also speak/write with great pain and urgency fueled by restricting definitions of motherhood – and womanhood – that I did not create (that we did not create). Almost twelve years ago, I made a decision to become pregnant. I made a choice. And, I did so without quite understanding the unschooling that is deeply needed around our cultural imaginations of both motherhood and womanhood in this country. However, the on-set of a high-risk pregnancy seven weeks into the first trimester changed my notions of what it means to be a woman, a pregnant woman, and a mother; my unschooling from the fantasy of normative motherhood as a shared middle class experience began at a potentially life-threatening risk to the fetus that resided within me! In this talk, entitled “The Fantasy of Normative Motherhood & The Invisibility and Marginality of Motherwork,” I share with you an auto-ethnographic account about womanhood and motherhood – socially-constructed discourses that excise the messiness of both – and the essentialized and falsely conflated relationship between the two. I do so from two perspectives, one from my body – raced, classed, sexed, gendered, and cultured – and one from the body of the American nation-state – also raced, classed, sexed, gendered, and cultured. Indeed, both perspectives are intertwined through intersectionality á la Patricia Hill Collins (2000). 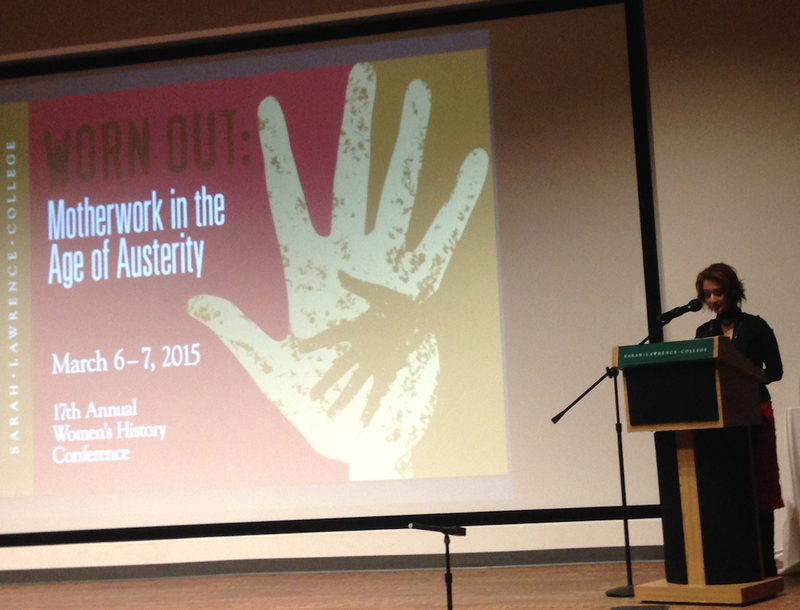 My self-narrative is intensely embedded in the notion of being “worn out,” doing “motherwork in the age of austerity”. What I hope to demonstrate in this talk today is that the conflation between womanhood and motherhood, including the notion of maternal ideology, has allowed mothers – an identity distinct from the category woman – to become a marginalized and invisible category and engage in motherwork in cruel and austere temporal-spatial locations, often at high physical, psychological, and economic costs. The question then is not why those of us who engage in motherwork are “worn out”. Rather, the question is, why would we not be “worn out” by engaging in motherwork? I begin my story by arriving to my late-20s and I found myself at the doorsteps of the fantasy of normative motherhood. I inhabited an ideal-typical life as part of the South Asian-American landscape. I was married – to a man, and he was employed. We purchased a home in an affluent Jersey suburb. We were healthy, we made our monthly mortgage payments and paid our annual taxes on time, we were over-educated with multiple graduate degrees, and we did not extend our “Othered” religious and cultural practices outside of our private spaces. For a moment, I believed that I had completed my mission as a Bangladeshi-American woman. What else was there left to do? I would be expected to so because my body is sexed, gendered, raced, classed in particular ways that fulfill the myth of the model-minority: I am a young, healthy, over-educated, and upper-middle class South Asian-American woman. An intersectional status much different from the pregnant, single women of color who were used as a platform to have politicized debates about the national HIV health crisis in the 1980s and 1990s and how we, as a nation, should respond (see Zivi 2005). Here, as I begin to think through what seemed to feel like an insatiable desire to participate in the process of procreating – conceiving and being pregnant, delivering a baby, becoming and being a mother, and engaging in motherhood through motherwork, I have become astutely cognizant that perhaps my “uncontrollable urge” had little to do with my biology but more so to do with the biology of a social system informed by patriarchy, paternalism, and misogyny; white privilege and racism; and predatory corporate capitalism and class. In other words, my decision to become pregnant, carry my pregnancy to term, give birth, and raise the child from the birth were framed by essentialized definitions of what it means to be a woman in America – a “real” woman, a “good” woman, informed by the patriarchal notion of symbolic immortality á la Roussèau. As I was approaching my thirties, I set out to search for my “biological clock.” While I was unable to uncover any “ticking,” I, nevertheless, announced to my then partner that I was ready to become pregnant, even though I was fully aware that one of the implications of a pregnancy is giving birth to a human being whom I would be fully responsible for in a multitude of ways. The conflation between womanhood and motherhood coated with the stickiness of morality is clear here. Over a decade later, his words haunt me still. I begin to suggest here that “maternal instinct” is a conceptual tool constructed in order to create and extend compulsive hetero-patriarchy and maintain ideal American citizenship and nationalism. Meyda Yegenoglu (1998) is pertinent as she argues that woman’s role in society is seen as a vehicle for cultural (re-)production. Yegenoglu helps me to re-experience a bitter memory: I am reminded of popular educational resources for expectant mothers, resources that imagined for me what I should want and feel as I become a mother. And, the fantasy of normative motherhood, which is informed by race and class, taught me a language system for evaluating both my successes and failures as a mother and also as a woman (Lusztig 2013). My high-risk pregnancy was accompanied by physical and psychological debilitations that impacted my work, my relationship with my partner and immediate family, and my psychological and physical selves. Plainly, I was receiving conflicting messages, one from my body and mind and the other from popular cultural imaginations informed by the medical industry. The medical industry has successfully excised the messiness of pregnancy and birth, producing a sanitized version of motherhood (Lusztig 2013). Barbara Katz Rothman (1990) is apt here as she points out in Recreating Motherhood that the complex process of human reproduction – which includes mothers, fathers, and children – has been reduced to a controlled clinical/medical event. Laura Tropp (2013) provides us with further insight as she describes in A Womb With A View how pregnancy moves from the hospital into the public, only to produce branding and marketing of pregnant women. The gender-revealing parties – where the bakers are informed first – are a case-in-point. I received the party line story of pregnancy, birthing, and motherhood! However, my body and mind were signaling to me otherwise. My lived experiences were uncomfortable and simply scary. A question that begs to be asked then is, what was I feeling during my pregnancy? I wanted out! I wanted to rip my belly apart and take her out. It seemed to me at times that she was directly looking at me with big hallow eyes through the imaging screen, calling out at me, “Mama, it’s me. Don’t you recognize me?” I looked away every single time. I felt no positive emotions when I saw her legs trying to push through the taut skin on my oval-shaped, scarred belly, trying to kick. Rather, it scared me á la Sigourney Weaver’s Alien (1979). In opposition to how pregnancy was imagined for me by What To Expect When You Are Expecting, I felt empty and alone. I requested an intervention: a termination of my pregnancy. However, my OB/GYN persuaded me to continue forward. Indeed, I became a reproductive threat and then an object of reform (Lusztig 2013). A common cross-cultural imagination of women. Joane Nagel (2003) concisely reminds me here that a woman’s body is required to pass down traditions to subsequent generations in order to shape ideas and feelings about race, ethnicity, and the nation. My gendered, sexed, classed, cultured, and racialized body was controlled to extend Bourdieuian cultural capital, one that maintains the boundaries of the nation-state. While, as Zivi points out, the reproduction of “welfare moms” and mothers who are HIV-positive or infected with AIDS are often (state-) controlled in opposing ways for the very same purpose of upholding American nationalism. In other words, I argue that race, ethnicity, class, gender, culture, citizenship, and nationalism collide in one instantaneous moment – the point of conception! Eight months later, it came time to deliver a premature but healthy baby girl. It was not until I touched my four and a half pound daughter – the warmth of her extraordinarily flushed petite face against my sweaty cheeks and her tiny salty and slimy fingers in my feverishly hot mouth – that I felt tender emotions for her; it was love. However, motherhood sanitized informed my coming experiences as far less than sweet. Hours after giving birth, I was unsure whether I wanted to nurse her. I was uncomfortable with the idea. Perhaps I wanted to protect my own selfish desires and insecurities around my body. And/or perhaps it was a function of my own fears about my sexuality. I posed yet another obstacle towards helping her towards subsistence. What was wrong with me? What kind of human being was I? What kind of mother was I? What kinds of woman was I? Clearly, my experiences with my pregnancy have had a profound impact on me, forcing me to re-think what it means to be a human, a woman, and a mother. I am not sure that I will ever be able to reconcile my pendulum-like feelings, and what I was left with was an unanswered question: what does it mean to be a “good” mother? I have come to realize that I have been asking the wrong question! The question is deeply problematic because it assumes the task of being a mother as an independent and isolated positionality and that the responsibility of mothering lays on one person alone, that of the woman. I have serious trepidations with the good/bad mother continuum because it does not reflect the realities of most women’s lives and it fails to recognize the vastness of mothering practices in the United States. Zivi argues through the good/bad mother continuum, multiple mothering narratives were invoked in the debates for both support of and opposition to mandatory HIV testing. The Ryan White Comprehensive AIDS Resource Emergency Act of 1996 represented support while Rebecca Denison’s congressional testimony in 1998 was in opposition. I am highly skeptical of State control of women’s bodies, but both camps invoked maternal ideology (good mother versus bad mother) to argue the same discourse: to ignore or not have maternal instincts undermines the bond between mothers and infants and that in turn threatens the very fabric of community. But Karen Zivi (2005) shows us to presume that good childcare is the natural outcome of instinct, first, renders women as wholly responsible for the care and well-being of their children, and, second, it erases the practice of mothering from social and historical obstacles that constrain it, like poverty, racism, and affordable health care. Unmistakably, the assumption here is that mothers alone are responsible for their children, and it is through the portal of mothering that the regulation of women’s bodies is justified. It is no wonder that we are worn out, doing motherwork in the age of austerity! While I am deeply indebted to those who have helped me to allow my daughter to survive, what my story begins to suggest is the very elasticity and compelling nature of motherwork. Collins reminds is that the range of women’s reactions to motherhood and the ambivalence that many women feel about mothering reflect motherhood’s contradictory nature. My narrative highlights the maternal ideology – the selfless mother – invoked and deployed to regulate and constrain women’s bodies, and my oppositional narrative of motherhood requires contesting dominant ways of thinking about motherhood and dislodging the unthinkable. My story indeed is about being defeated, lost, and struggling while simultaneously celebrating, triumphing, and transforming. In the midst of being both defeated and triumphant, Collins urges me to think about “the personal meaning of mothering,” that motherhood can be rewarding, but it can also extract high personal costs, including economic ones. Bio: Dr. Roksana Badruddoja, a second-generation Bangladeshi-American, received her terminal degree in sociology from Rutgers, The State University of New Jersey. Before joining Manhattan College as an Assistant Professor of Sociology, she was the Vice President of Research for the Partnership for the Homeless in NYC. Up until then, she was an Assistant Professor in the Women’s Studies Program at California State University, Fresno. She teaches courses on feminist research methods, women of color in the U.S., feminist activism, race and ethnicity, sociology of gender, and representations of women. Dr. Badruddoja’s research in the areas of race and ethnicity, sexuality, gender, religion, and culture, and how these impact South Asian-American women has been published in numerous peer-reviewed journals. These include the National Women’s Studies Association Journal, the Journal of the Association of Research on Mothering, the International Journal of Sociology of the Family, and the International Review of Modern Sociology. She is the author of Eyes of the Storms: The Voices of South Asian-American Women (2012) and the editor of Bittersweet: Decolonizing the South Asian Diaspora (In Press). Dr. Badruddoja’s new research lies in the field of “Mother Studies.” As an emerging scholar of “Mother Studies,” she is attempting to expose the fissures between the ideological representation of motherhood and the lived experience of being a mother. [Read More].